Institute captain Michael McCrudden was delighted after their high scoring win over Cliftonville. The crazy encounter at the Brandywell, which saw him net four goals, seen the home side win 6-4, in what really was a Christmas cracker. 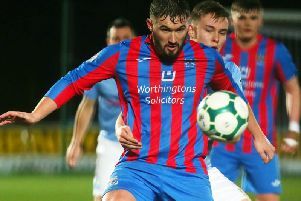 McCrudden was also quick to state that him and his team-mates need to keep their feet on the ground and make sure they are ready for bottom side Ards, on Boxing Day. Institute captain Michael McCrudden has now netted 14 goals this season.